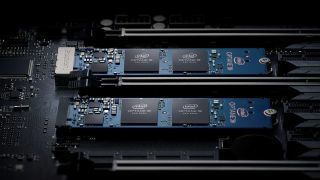 Windows 10’s latest major update has seen a number of bugbears strike, and the latest appears to be a show-stopping problem for owners of certain Intel SSDs. Apparently, there’s a compatibility issue with Intel SSD 600p Series and Pro 6000p Series NVMe drives, whereby users installing the Windows 10 April 2018 Update could experience a crash, with their PC rebooting to a UEFI screen. Nasty. Microsoft further explains that there is a known incompatibility problem with these SSDs and the update may cause “performance and stability issues”, and that as a result, it’s currently working with Intel and hardware manufacturers to block the April 2018 Update from machines running these drives. So there will be a temporary block in place, and once the software giant has implemented a fix, the update will be made available for PCs with these SSDs once again. As the Register reports, for the moment, if you have one of these Intel drives and have been hit by this problem, Microsoft’s advice is to simply take a step back and reinstall the previous update (Fall Creators Update). If you’re stuck, there’s further help provided by the company on how to do that right here. Also, if you’ve encountered any other issues with the April 2018 Update, we’ve got an extensive guide on how to troubleshoot problems. Other issues encountered by folks moving to the update include a glitch where Google’s Chrome browser is locking up, problems with some Alienware laptops (which have also been blocked from installing the update for now), and a rogue patch that actually seems to cause a ‘black screen of death’, which is another particularly nasty one. With sprawling updates as complicated as the ones Microsoft pushes out for Windows 10 on a twice yearly basis, there are always going to be niggles of one sort or another. We just have to hope that they’re only minor bugs, although as we’ve seen this time round, that isn’t always the case.